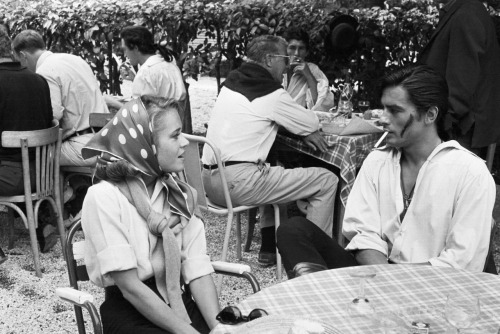 Jane Fonda and Alain Delon on the set of "La Tulipe Noir"
Like many kdrama watchers, I'm going through a kdrama slump. 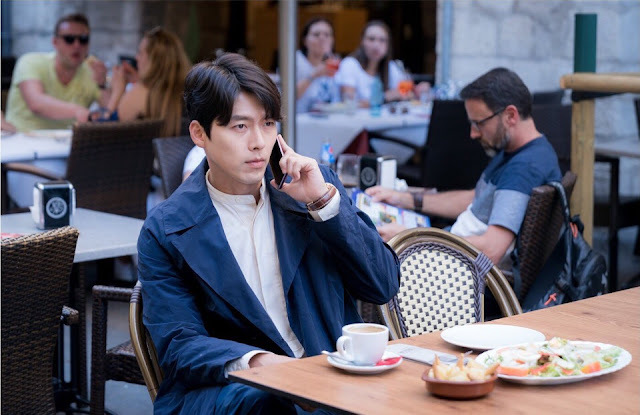 The only thing that keeps me in my kdrama watching shape is Memories of the Alhambra. 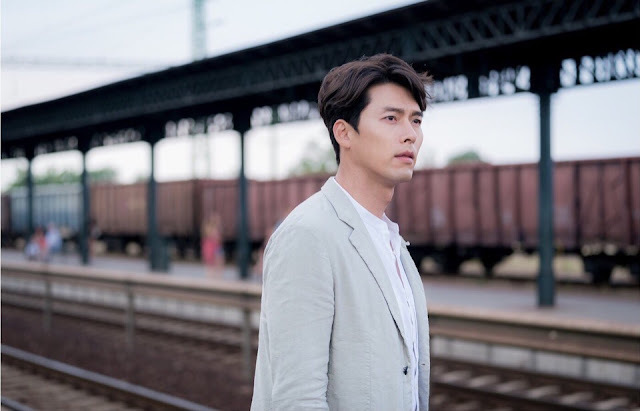 Despite all the flaws and weak sides of the drama written by the author of thrilling W, I find this drama quite captivating. And, of course, between intense action scenes, I find time to appreciate fashion in this drama. That's what I want to talk about. 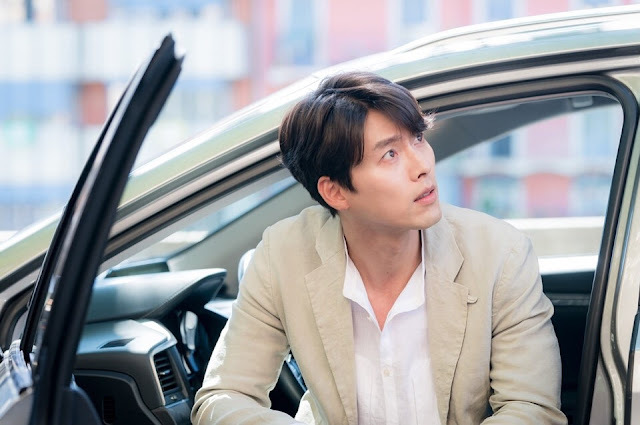 Yoo Jin Woo's style - that's what really caught my attention. The typical minimalistic style of a CEO: muted colours, simple cuts, the prevalence of khaki, ochre, beige and blue colours. It really fits a collected, calm, dedicated and bit cold, but selfless rich tech engineer - nothing redundant. 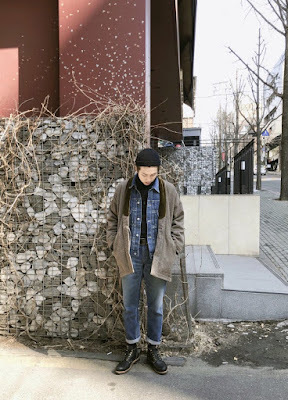 Neat and casual looks highlight Jin Woo's reasonableness, his down to earth, intelligent nature. Although the looks are quite simple, they somehow manage not to look boring. 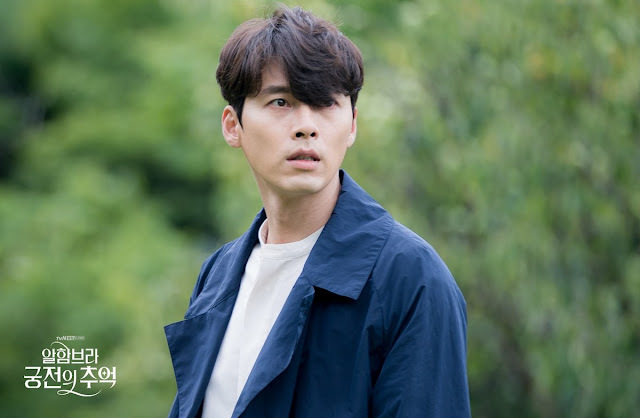 Maybe it's Hyun Bin's doing or it is just my enormous love for minimalistic Korean style talking. Jimin is a vocalist and the master of contemporary dancing style. It's interesting how his looks make him seem unapproachable when actually he's one the most caring people, the guy who's always there for his members who need comforting and is the emotional support of the group. Fans gave him the nickname Mochi after a Japanese dessert. The artist himself is jokingly struggling with deciding whether he is an angel or a fairy. I don't know either, but I know one thing for sure - he's definitely a fashionable creature. He is one who is great at juggling chic and casual styles, combining both of them and resulting in very cool and elegant outfits. 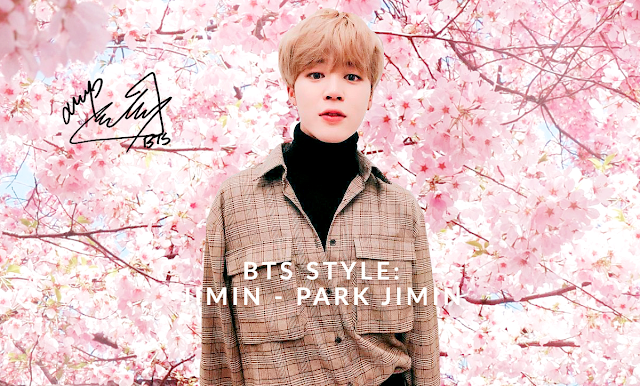 Drastic changes in his style can be explained by Jimin clothing himself according to his mood that day. 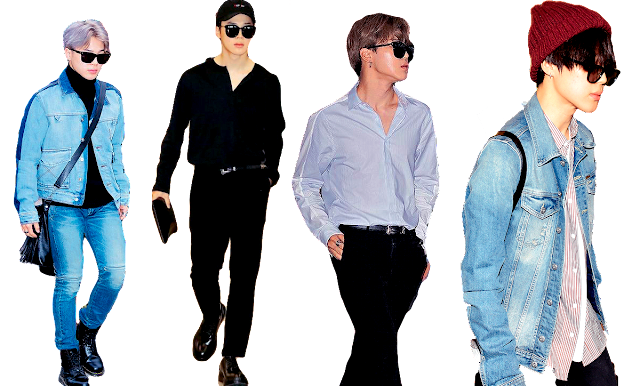 When he chooses the casual style, he doesn't overdo it with loose and way too relaxed outfits – his looks are neat and no matter how casual it may look it always has some classy vibes that make his style look classy and cool with a touch of formality. 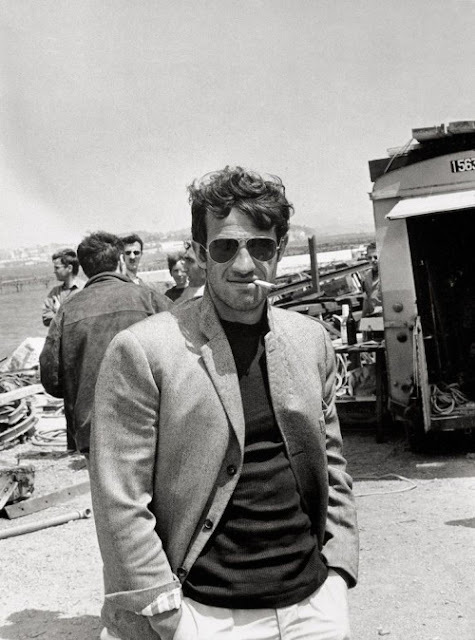 For example, a simple look he accompanies with belts and perfect fitting (most of the time denim) jackets; if he's wearing a shirt it's always buttoned up. 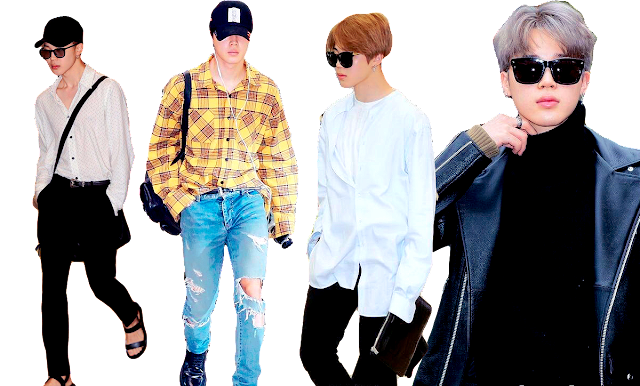 Jimin prefers a silhouette where the top is baggy and loose and the bottom consists of skinny pants or jeans with heavy shoes. For instance, it might be Dr Marten boots or Maison Margiela chelsea boots. The singer loves to add some colourful accents and classic prints like chess and stripes. The latter is one of Jimin's favourites. The artist also loves turtlenecks, wayfarer sunglasses and beanies. These are not the only accessories that Jimin often wears; he also loves rings, bracelets and earrings. Unlike his colleagues who prefer simple and minimalistic earrings, Jimin also chooses long earrings which make his looks more elegant. This is another distinguishing feature of his style – no matter what he's wearing - whether it is a rocknroll leather jacket or a simple shirt-pants combo – he looks elegant and sophisticated with a touch of chic. 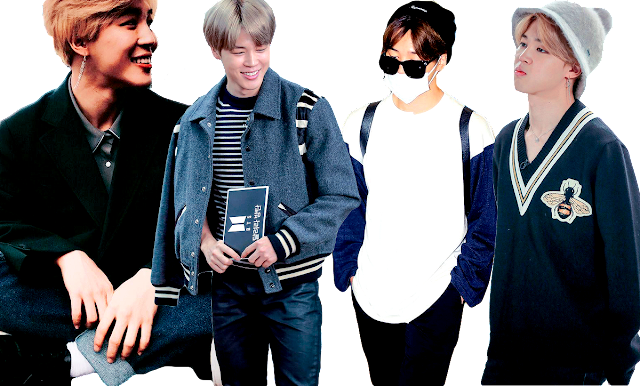 Jimin knows how to wear casual clothing and yet look serious and presentable without being afraid of making it feminine and softer. His fashion style mirrors his dancing style in some ways – the mix of contempt, popping and hip-hop: soft and smooth pas turning into sharp, definitive, edgy moves. 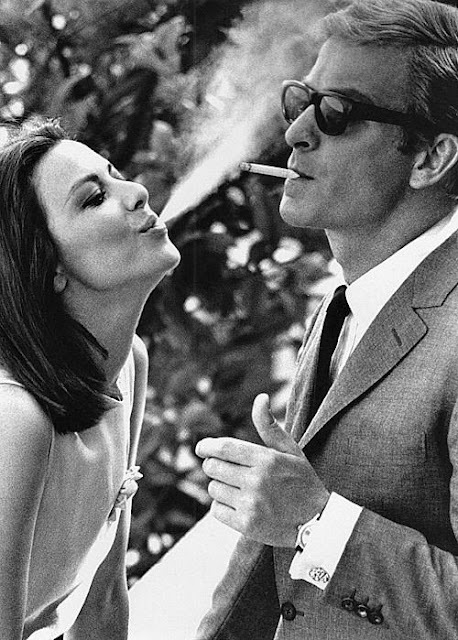 The similar balance remains in his clothing choices creating a rock'n'roll chic with a bit of softness and elegance. Land of the rising sun, where blooms of the sakura attract thousands of viewers from all around the world, a place were traditions and modern views easily coexist. We are in Japan. It is impossible to imagine culture of the modern world without Japan’s gifts of karaoke, sushi, anime, ikebana and much more. Also, I guess many children were raised or at least have seen the Pokemon or Sailor Moon cartoon TV series, including me. Although Japan was an isolated country for a long time, the first cultural tsunami wave had reached western world in 1862 after International Exhibition in London, which caused appearance of the phenomenon Japonism. Japanese influence spread everywhere, from interior design to art, especially in French impressionism, and even affected Van Gogh’s work. 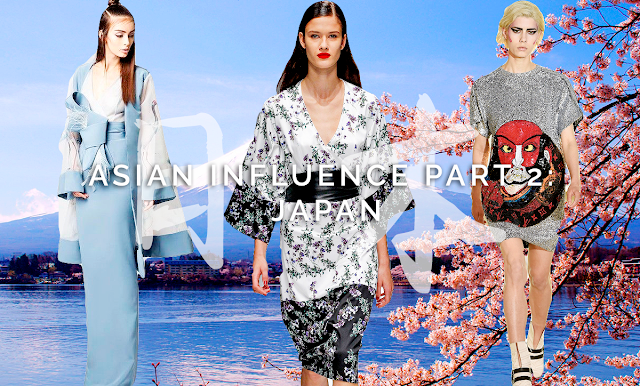 To the fashion sphere, it brought traditional Japanese attire-kimono and geisha image. Namjoon is a leader and philosopher of the group. 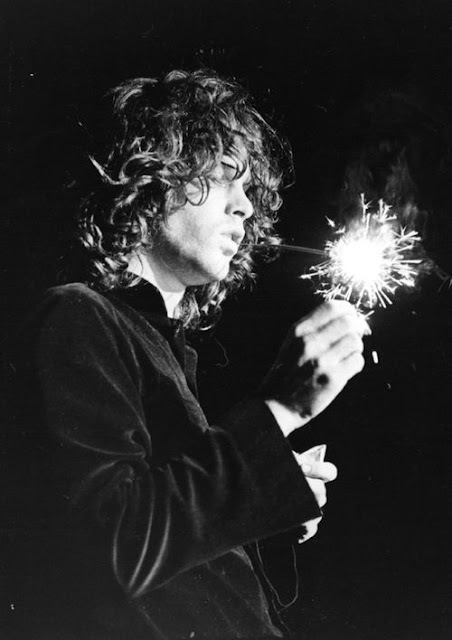 He's a deep and thoughtful person who can find beauty in everything and can be inspired for some serious meditations by even mundane things; this is reflected in his style. I would describe it as intellectual hipster style. It's an unusual and well-balanced approach to clothing where soft, muted colours like beige, white, khaki, and grey prevail. Lots of denim, beanies (he always feels like covering his head) and comfy oversize hoodies. For him music and fashion are two main ways to express himself and as an artist he values it. His interest in fashion and acknowledging it as a tool of self-expression began in junior high when he was searching for and purchasing clothes online. 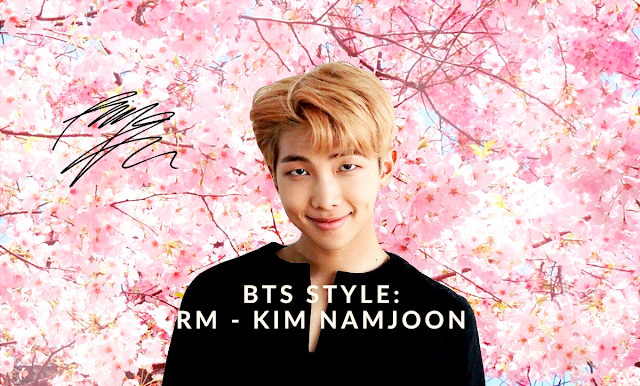 Namjoon is really into streetstyle fashion culture and takes a lot of inspiration from it, especially legendary Japanese streetstyle. 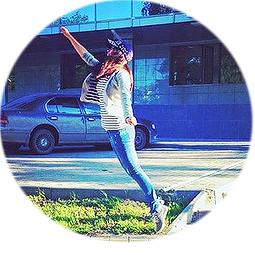 Like many of us, people interested in fashion, he goes through streetstyle photos to gather ideas and tips, so he can apply some to his own style. That's where these downtown vibes are coming from, the urban influence is apparent. He's also influenced by his favourite Japanese brands like WTAPS, Neighbourhood and Yoji Yamamoto. The latter is his main inspiration and it's no wonder since among designers Yamamoto is recognized as romantic and a philosopher of fashion, who popularize wabi-sabi, monochrome, modesty, simplicity and loose cuts. I think, it really goes along with Namjoon's mindset and persona style. He's also eager to share his fashion discoveries with his fans through the twitter with KimDaily hashtag and it's easy to monitor his style and clothing preferences. Laconic layered looks in neutral colours with emphasis on an item in a lighter colour, it might be a scarf which is his favourite accessorize, or a t-shirt. 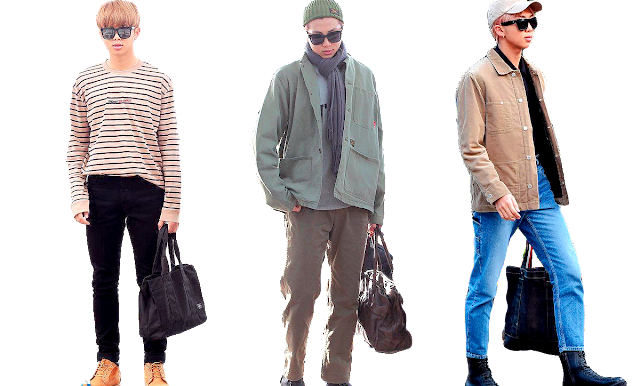 Namjoon often chooses long straight silhouette coats, which highlight his height, or baggy parkas. His recent fav is a kimono cut jacket from Visim – Japanese brand clothing which he has started appear in more often. 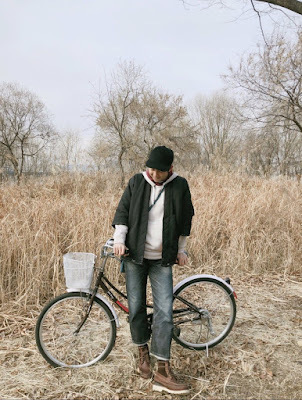 Moreover, like many Koreans Namjoon loves cropped pants, especially 90's style wide cut. 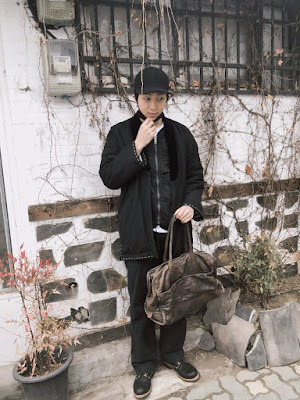 Through urbanistic minimalism with a touch of Japanese streetstyle inspiration, Kim Namjoon became a bright representative of Korean street fashion where simplicity and comfort combines. Moreover, he's a great example to show that the fashionista is not a superficial creature, but being an intellectual who's interested in fashion is really cool. 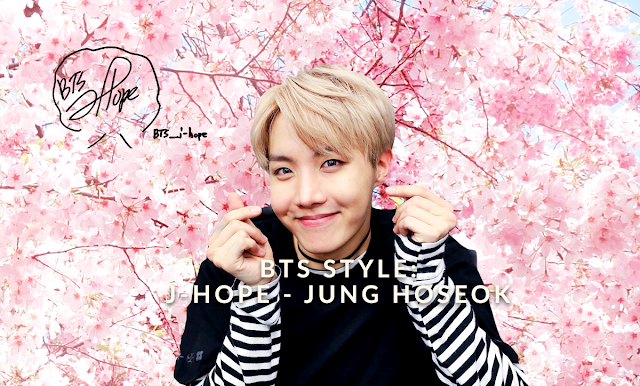 The main dancer and one of the rappers of the group J-Hope is not only a choreography pro but also the source of sunshine and positivity for band members and fans, as he says himself: "I'm your Hope". Such an upbeat person, who fills any room his enters with his presence and radiant vibe, has his own way to express himself through clothes; let's look at how he's doing that. 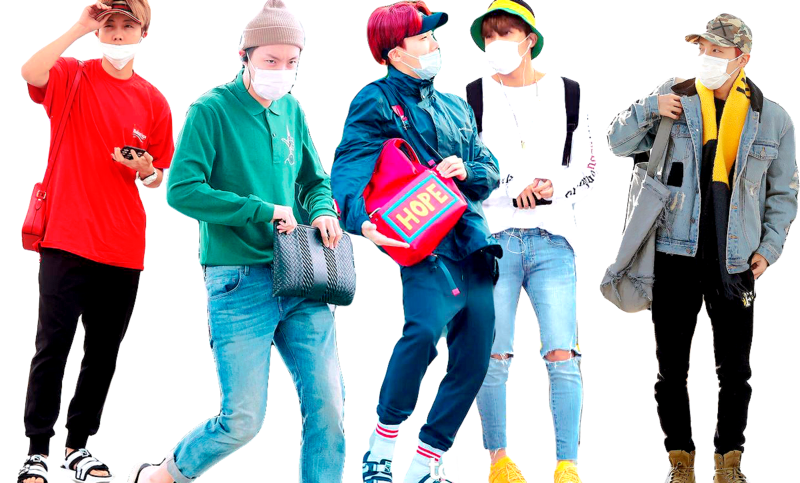 Energizer-Hoseok's style is hard to define. It's always very different, resembling a fashion rollercoaster: today he's wearing a simple totally black t-shirt and jeans look, tomorrow he has more than two colourful prints on him; or he turns to comfortable airport looks with sweatpants and sandals; however, he can get really chic with a leather jacket jeans ensemble on the next day. For example, his basic look can be a beanie, tucked in skinny ripped jeans, a simple shirt and active floral bomber or a multicoloured sweater. His underground dancer past also finds its way to his wardrobe when it comes to relaxed and loose looks with a touch of hip-hop style. He keeps it simple with the silhouettes, however, never forgetting to add and mix a lot of colours and prints. 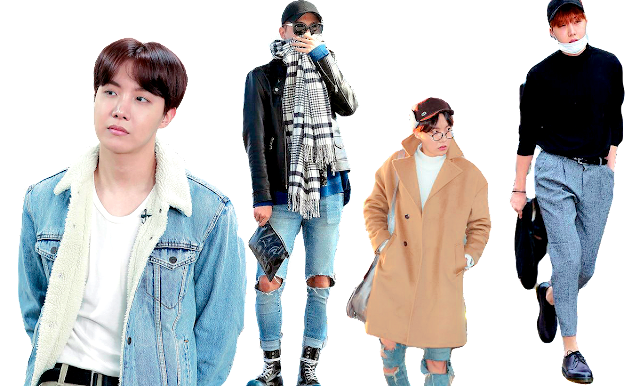 When Hoseok is not in the mood for multicoloured outfits, he still leaves some space for colours in his looks, there's always some kind of a bright spot, whether it's a scarf, round glasses with red lenses or a bucket hat in his favourite green colour. 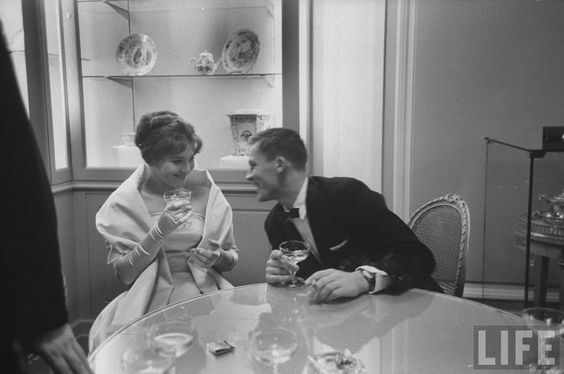 His interest in fashion and experimental nature is shown in his manner of dressing. Hoseok's trying to keep up with the hottest trends and adapt them into his style while bringing into them his bright and cheerful personality. Therefore, most of the time he chooses colourful and unique combinations; he's not scared of mixing up a variety of prints at once. It might have looked bizarre on another person, but Hoseok certainly pulls looks like that off. Probably because colourfulness matches his sanguine and loud personality and finds its expression in bold outfits. Hoseok's sense of adventure, that was rooted in childhood when he was immersed by Jules Verne books, is reflected not only in his life, but in fashion as well, where he takes risks and paints everything in bright and juicy colours. His positive personality spreads good vibes and his clothing style is a great addition that emphasizes his character. 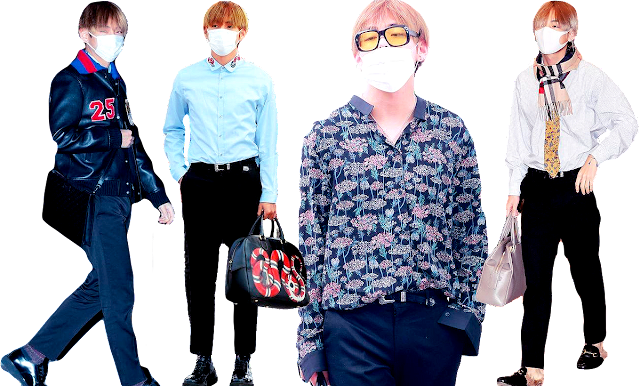 Summer child and the most beautiful face of 2017, Kim Taehyung real fashion icon material and I'm going to tell you why. 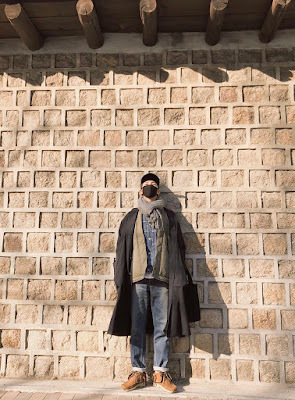 Taehyung is known for his quite unique and quirky fashion taste, which people used to make fun of. However, now it's his signature style that makes him stand out. No matter what kind of outfit he's going to wear, he's going to pull it off in a very effortless and dashing manner. What makes it so special? Its liberating vibes: oversized and baggy cuts, culottes like trousers which he wears a lot, and cozy sweaters, and what is most important, absolute freedom of style choices. For instance, during the BTS USA promotion, Taehyung once wore a Burberry pyjama set accompanied with a denim jacket. That's chic and a whole new level of carefree laid-back fashion. 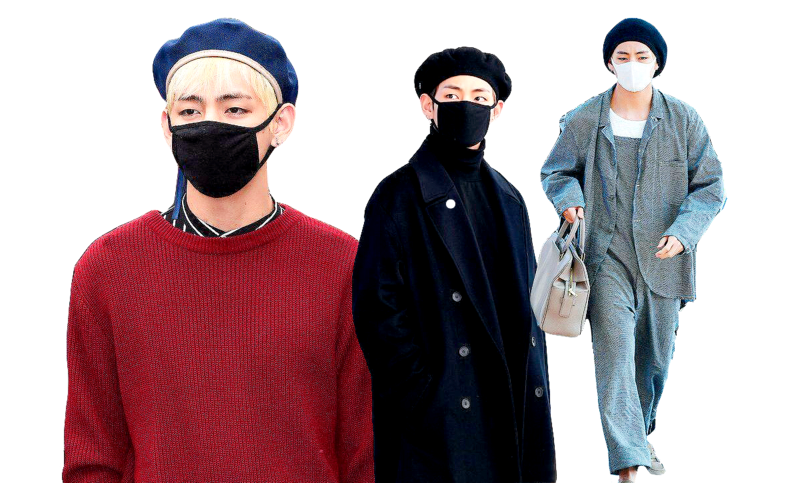 This relaxed manner of clothing coexists with Taehyung's inner expensive man fashion alter-ego. 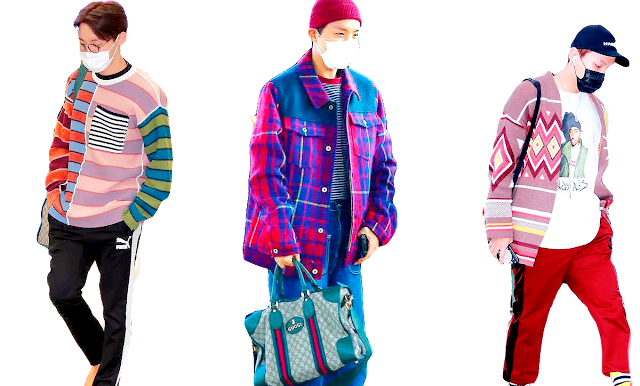 BTS' member is known for his immense love for Gucci and it seems he infected other members with it and stylists of the group as well, because lately we have seen them perform on stage and in mvs wearing Gucci's vibrant and colourful outfits. Tae easily combines pieces of his favourite brand and seems to have really mastered it. Alexandro Michele and his PR team have to wake up and notice a very influential potential Gucci ambassador, who's not just being dressed by stylists but has a genuine interest in brand clothing and his own exceptional and stand out fashion style. 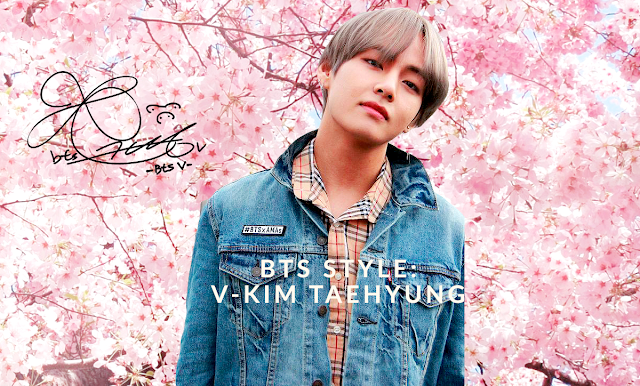 Kim Taehyung is not only a talented singer and fashionista, he's a romantic old soul who loves trot, gets inspired by melodramas (and Domhnall Gleeson's suits in About Time), loves Van Gogh and photography. His artistic nature is shown in his looks; for example, you can see it in his preference for oversized coats and berets , which adds softness to any look and makes it more artsy. This goes along with Taehyung's love for vintage and old-fashioned cuts. For example, he really loves different eyewear and prefers not only the popular in South Korea classic round glasses, but also old school aviator glasses. Taehyung is an example of fashion boldness and eagerness to experiment and discover new style possibilities. He easily mixes elegant pieces with something super simple and is not afraid of it. Because, firs of all, he dresses for himself. 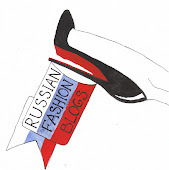 He follows his inner fashion intuition rather than blindly pursuing the hottest fashion trends. 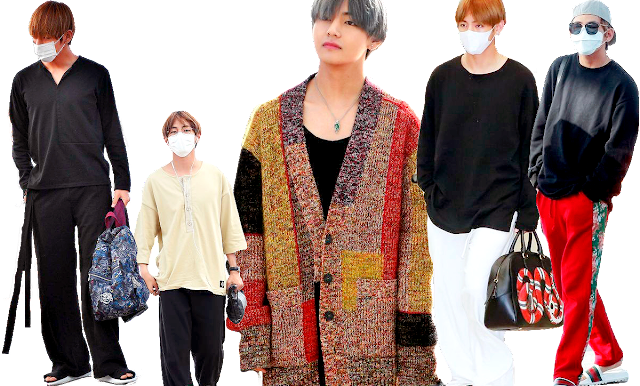 Moreover, styling his own looks is for Taehyung a whole creative process in which a lot of inspiration is involved that including movies, BTS' onstage fashion, art and his surroundings – a real style role model.